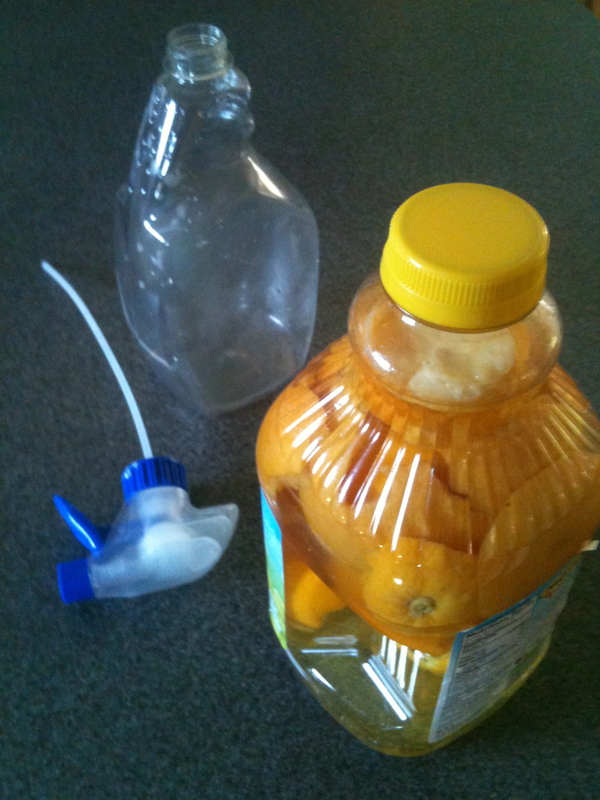 The Homesteading/Survivalism Facebook page posted a simple photo of a DIY orange cleaner with some very simple directions. It immediately caught my eye, and I had all the ingredients on hand, and thus I figured: why not! 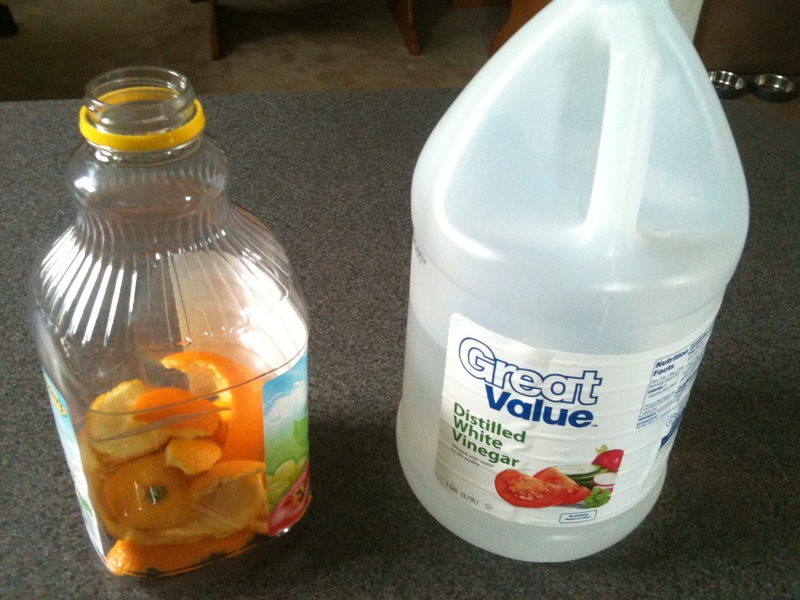 I use White Distilled Vinegar (WDV) nonstop for all my cleaning and housekeeping needs, and I am from Florida… so citrus meets WDV seemed right up my alley. 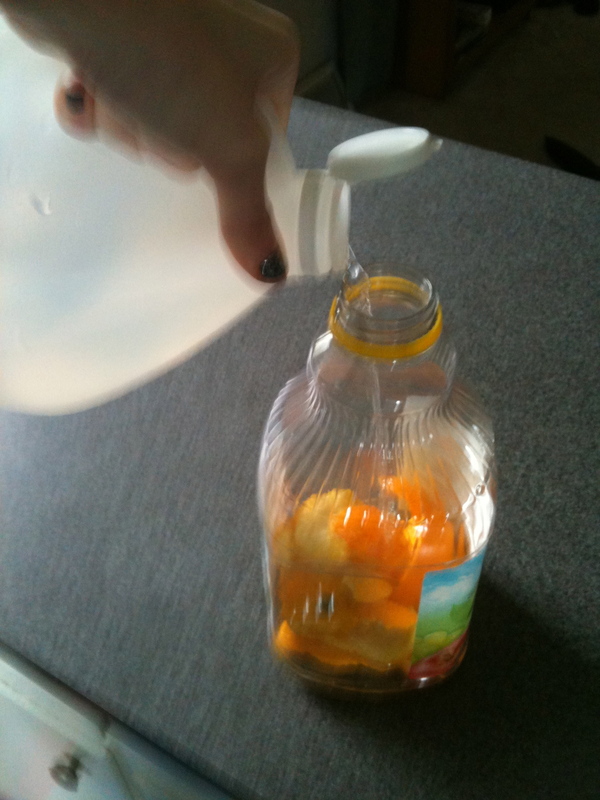 I didn’t have a jar on hand, but I did have an empty juice jug, a near ’bout empty Lysol spray bottle, some oranges and a grapefruit. 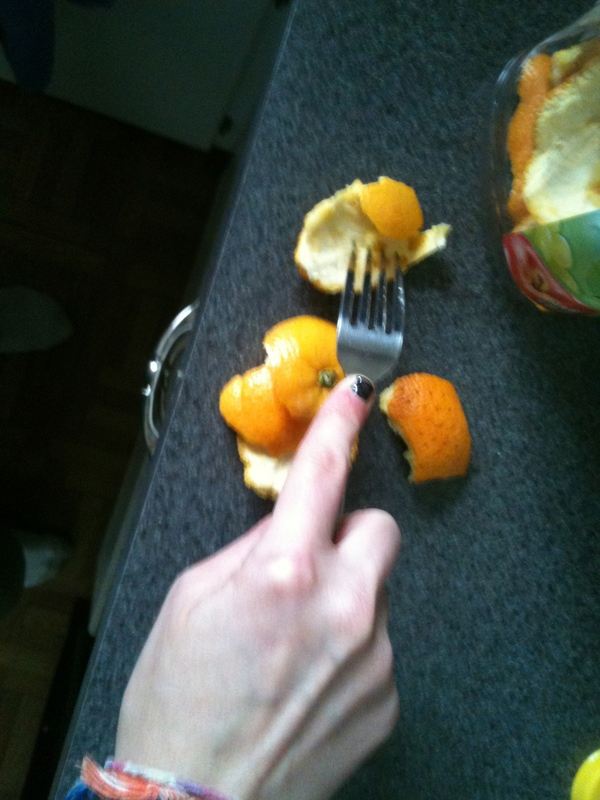 I used three oranges and one grapefruit, to be exact. There wasn’t an exact science to it, just citrus peel + WDV, let it marinade for 10 days. 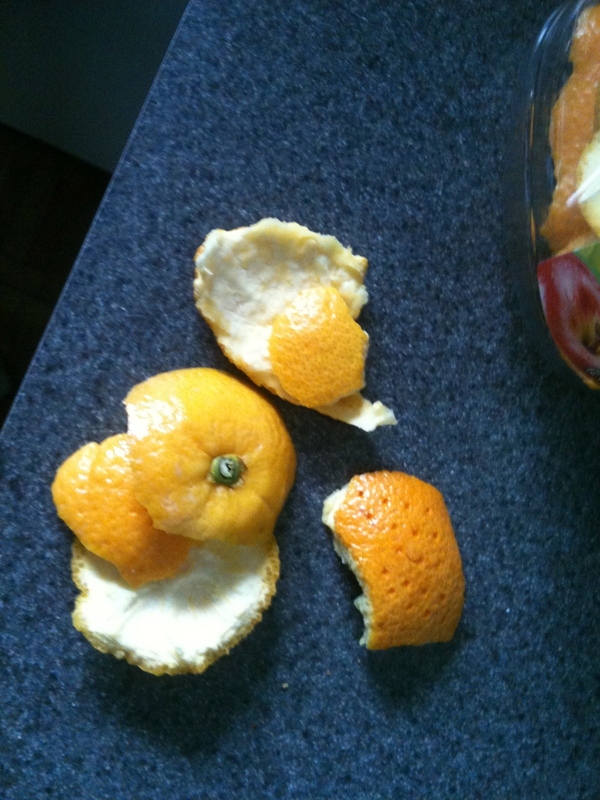 orange peels from a midday snack were easy enough to us! all you need! it is that simple. full bottle is ready to marinade now! A caveat I was worried about? 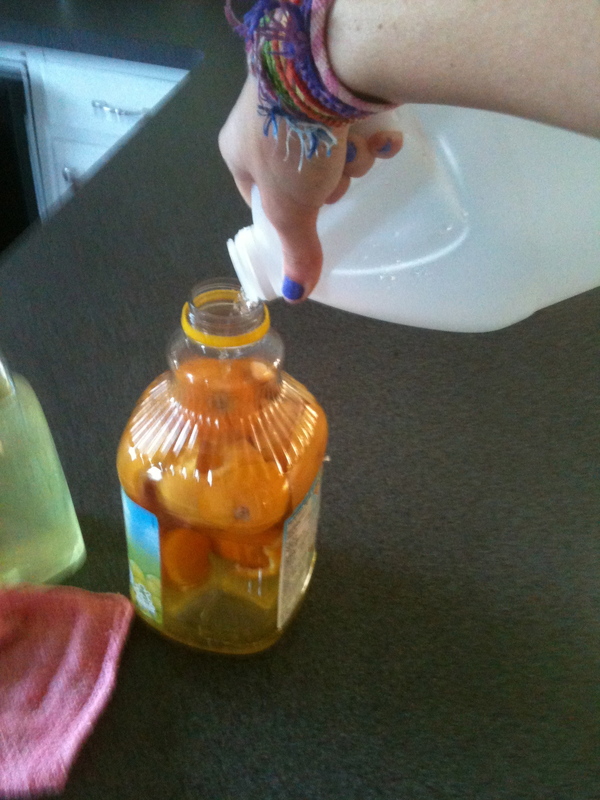 My sloppily peeled oranges would have too much pulp attached – thus adding juice to the mixture, making the cleaner sticky. The final test was the sticky factor. 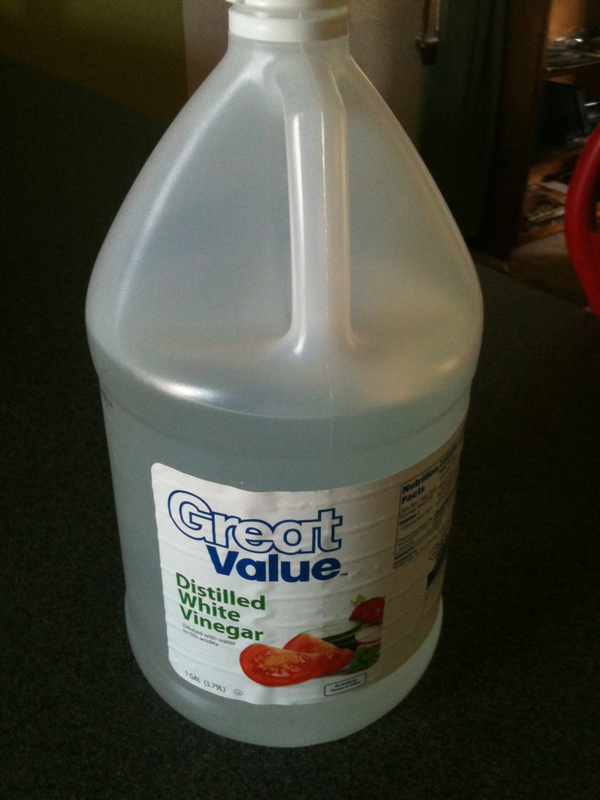 I also wasn’t sure by how much to dilute it (I always dilute WDV with water as an all-surface cleaner). 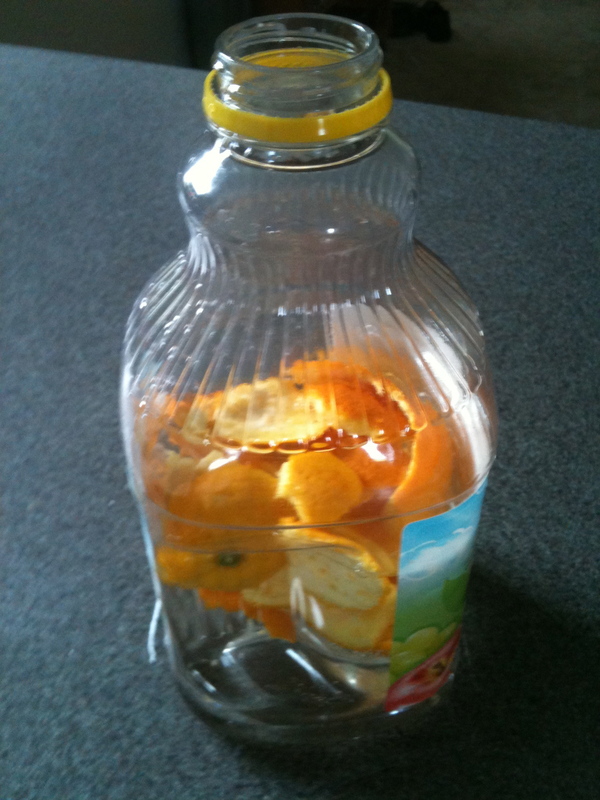 I didn’t want to lose all the citrus smell-good by adding water, but full strength WDV seemed a bit too strong. I was so rip roarin’ ready to go! 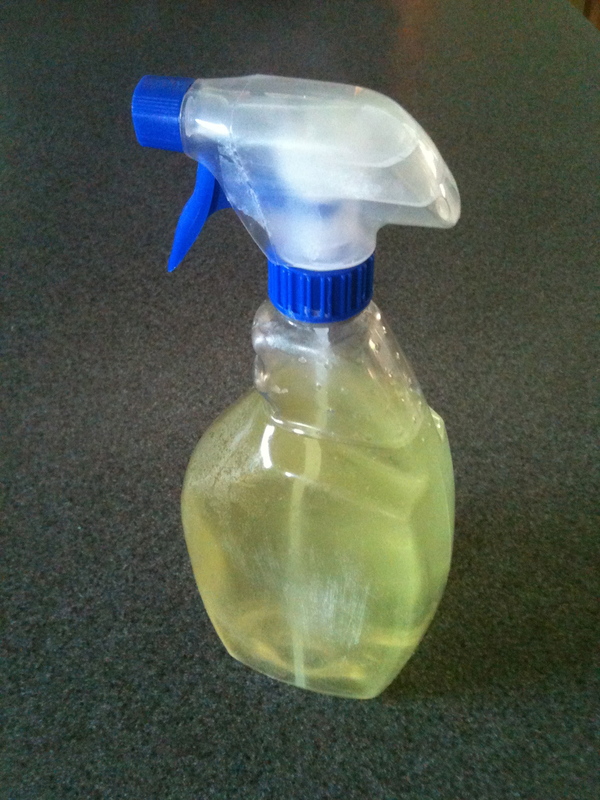 a lysol spray bottle i recycled to hold my new citrus cleaner. the hardest part of the whole project was getting the stickers off of it. what an epic pain that was! The BEST SMELLING vinegar ever. the smell test: amazing. 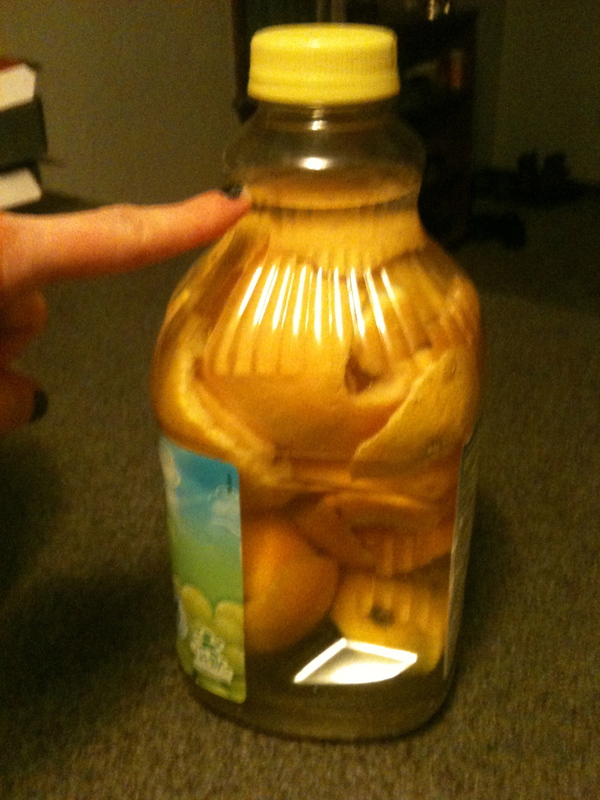 you can’t even tell it’s vinegar, it’s just so super orange-y fresh. i love it! 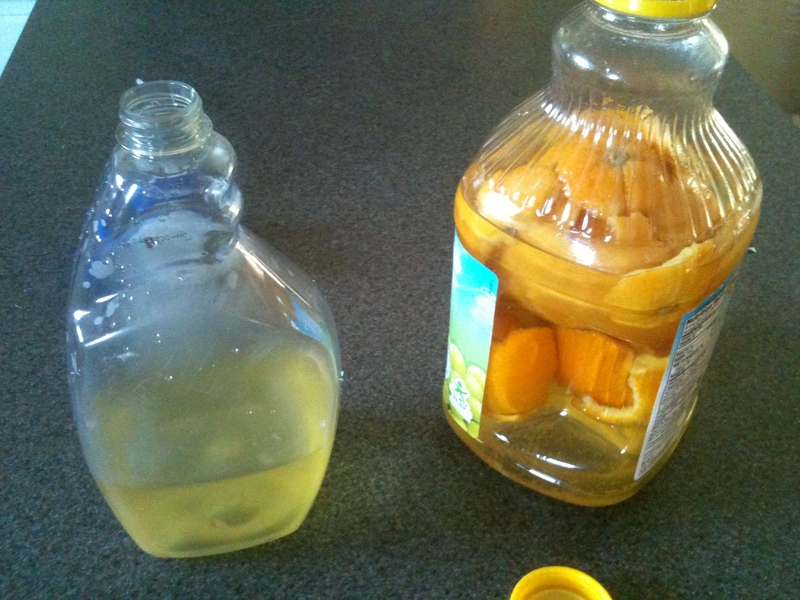 You can hardly tell it’s vinegar, it’s amazing. Sticky? Not at all, it’s a perfect cleaner. the sticky test = passed with flying colors. not sticky to the touch at all, whatsoever. the counters just felt nice and clean. I ended up eye-balling the water-to-WDV ratio. I have a feeling I’m going to use this sweet little mix for everything. It’s heavenly in the kitchen, that’s for sure. My next test will be mopping with it (I already mop with WDV + water). The next batch I make? Lemon-lime. I want to make all kinds of varieties with citrus. …top ‘er off, and good to go! 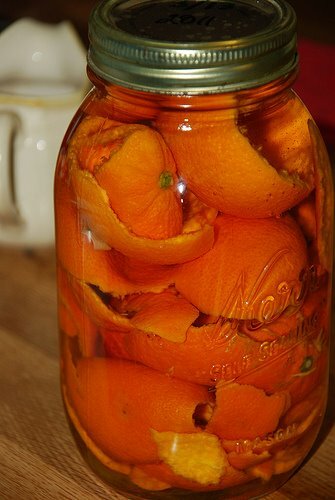 A friend told me she just always adds in more WDV and citrus peels, and just keeps a batch brewing all the time. I think I’ll do that for a while and see how it goes. 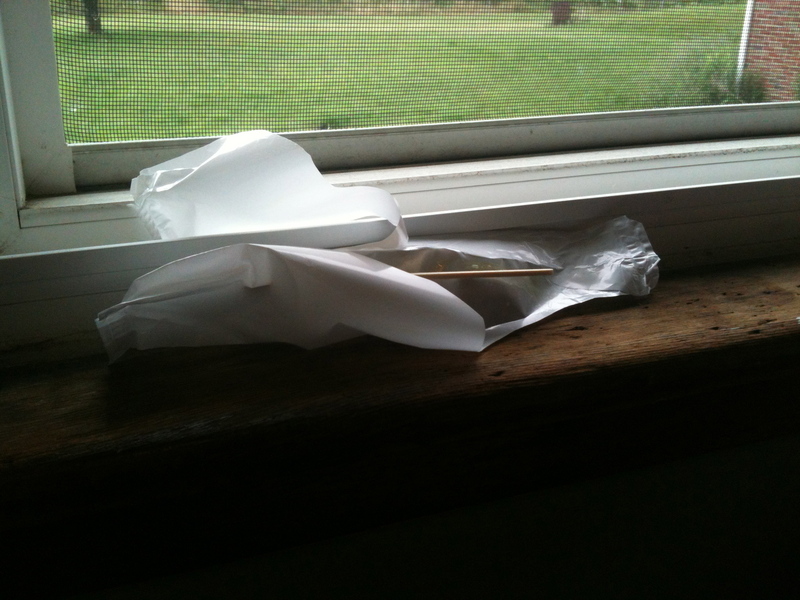 She also mentioned she keeps it out of the sun, so I moved mine off the window sill and into a dark cabinet. Hey Rose, why do you use WDV all the time? Great question! I love WDV; it’s a real jack of all trades. It’s an all-natural, vegan, pet/baby/kid/anybody-safe substance that’s a disinfectant, a degreaser, a natural fabric softener, insect repellant, water stain remover, and cleaner. It’s cheap, easily produced, and a great way to stretch out fancier/pricier products so they last longer. It’s also fabulous on its own. The smell is a little funky when plain WDV is wet. 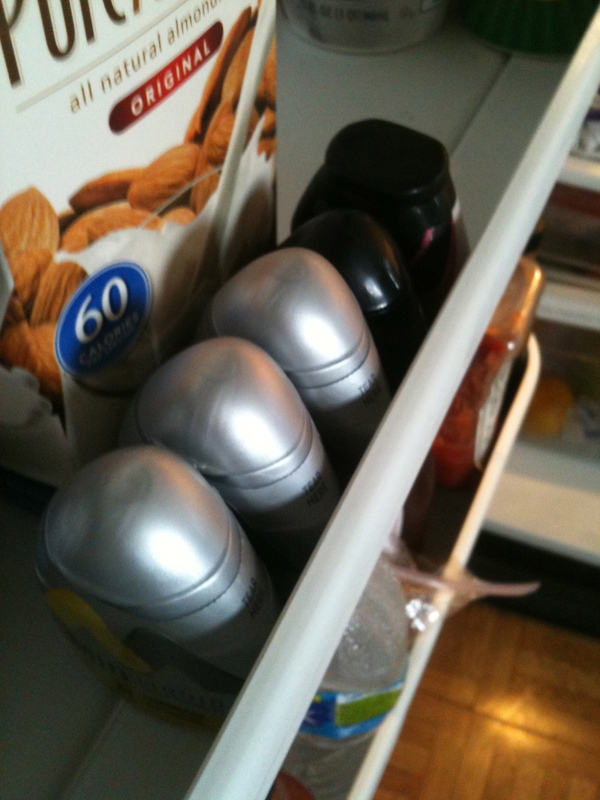 However, it always dried odorless (no, my clothes NEVER smell like vinegar, neither does the house, etc.). I love keeping a clean home in a way that’s safe, healthy, and earth-friendly. Now, go eat an orange or three and start brewing your own batch! 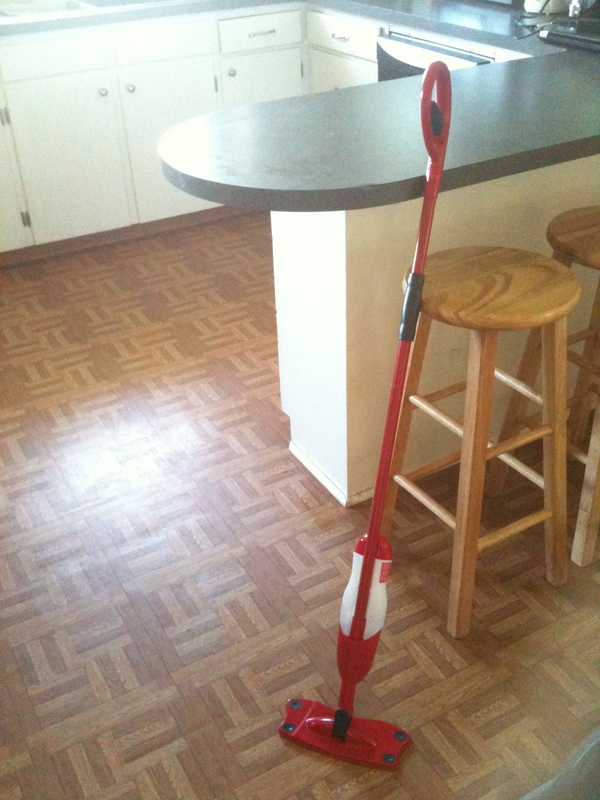 Today I mopped with my new citrus cleaner, and oh yeah – it’s awesome! The floors dried perfectly clean and lovely, and the house had this all-over citrus smell as I was just cleaning away. LOVE! I’m writing to you in recovery mode, trying my hardest to type with sore hands and wrists from a very wacky week indeed. Great news, huh? Shipping the car from Hawaii to NY/NJ took about five weeks? Was it more? I can’t keep time straight anymore. Anyways, we got an email that our car was due in, and then I was struck with a brilliant idea: why don’t you make it a boys’ trip to NYC to go get the whip, and I’ll stay here with the doggies and work, etc. Are you reading between the lines dear friends? As a Marine wife, going through deployments and all that long distance junk… you learn this wonderful appreciation for when your husband is actually home. I feel like our time apart via circumstance has led to all the more cherish our moments together. But like all things in life, there’s a flip side too: you learn to become quite independent and don’t so much mind some alone time. I’ve always been pretty self-sufficient when it comes to the entertainment department, I can keep myself busy for days with all my hobbies, interests, books, projects, running and what not. So it’s not like I flounder and freak out if left to myself for a bit. And quiet? Oh I relish the quiet. The peace. Ahhh. So yeah, I basically booked their airfare, schlepped them to the nearest plane harbor and said “don’t let the door hit ya…” as I gazed upon two-point-five days of sweet, sweet loneliness. 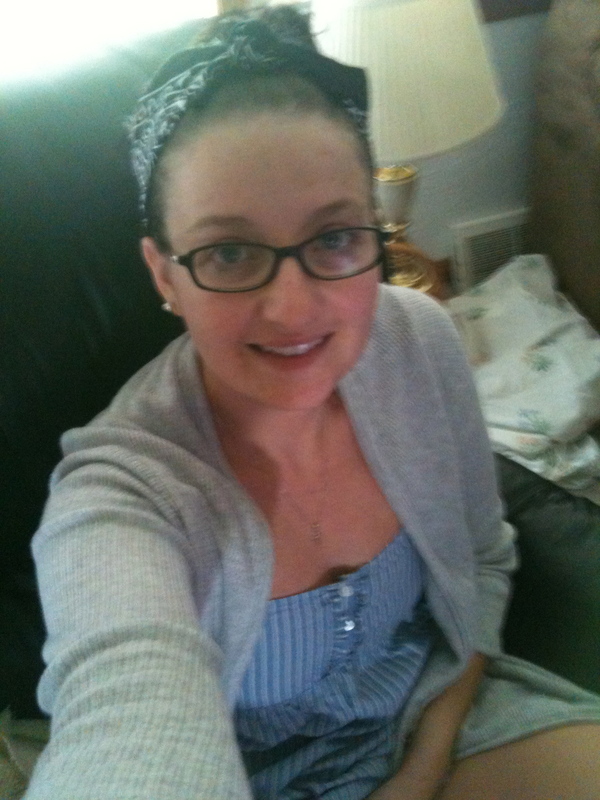 Yes, I still had to work- but I’m calling it “my staycation” because I got to do whatever I wanted, whenever I wanted. Real Housewives of NYC, OC, and NJ? I’m all caught up. Don’t Be Tardy For The Wedding, too. I even had time to squeeze in some documentaries AND watch the Bravo marathon of last season’s Million Dollar Listing LA. I slept on the couch. I stayed up very late, and then slept in – just the way I like it. 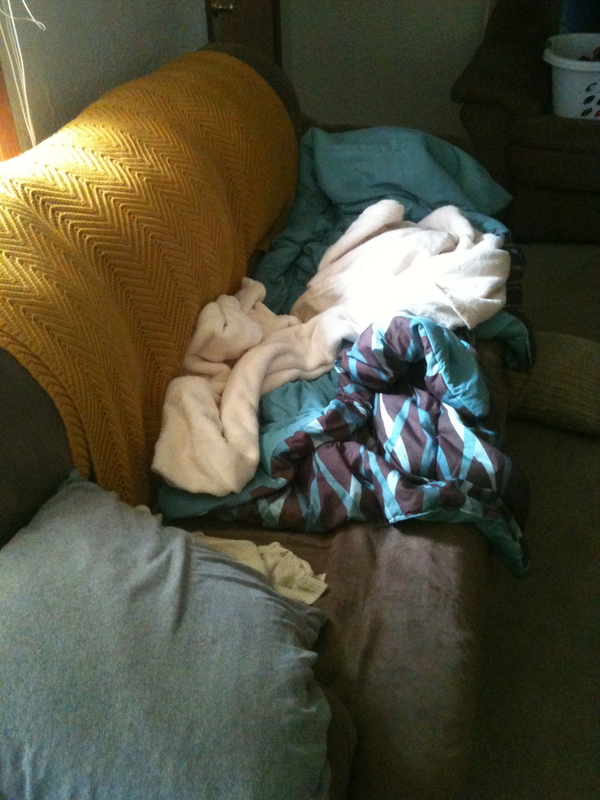 one man’s couch is another hippie’s bed. I went running, did my yoga, worked out at home- all whenever I wanted to do. I ate microwaved s’mores for just about every meal. You think I’m kidding? It’s no joke. 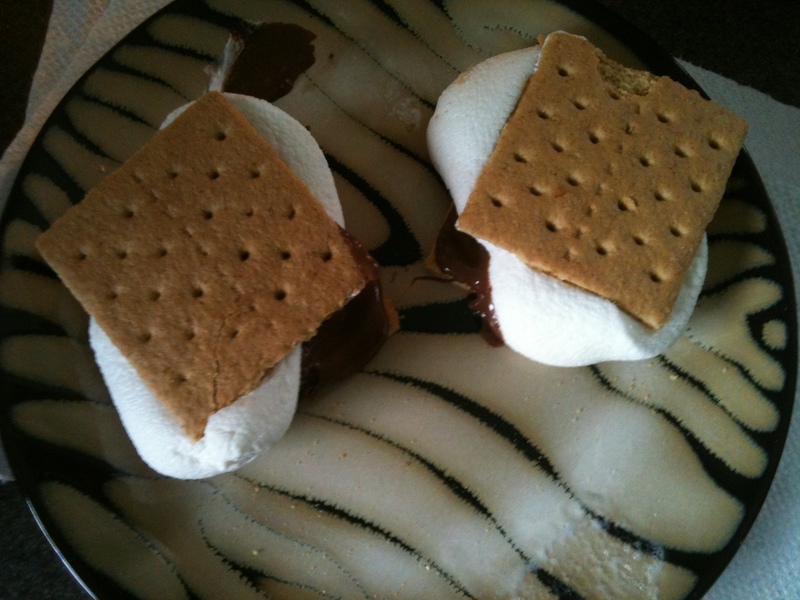 (New diet starts this upcoming week, so I say s’more ’em if you got ’em). 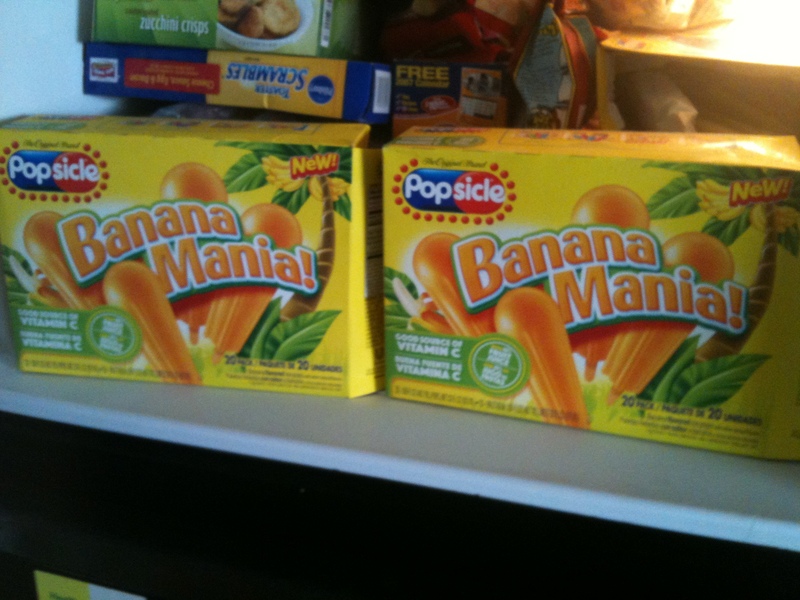 I ATE AS MANY BANANA ICE POPS AS I WANTED. 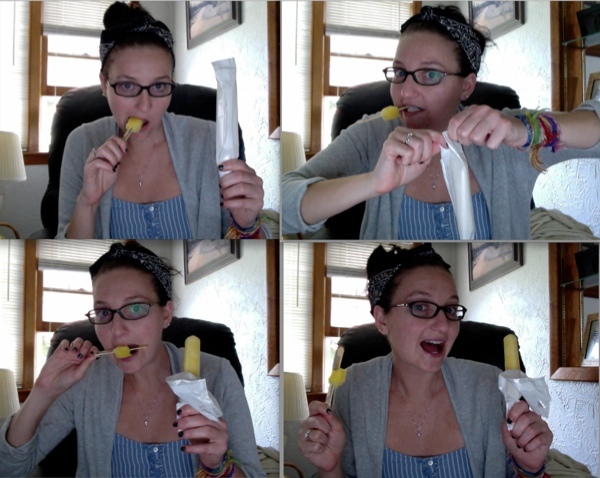 I enjoyed each and every one without the stink eye from Duggs-the-cheapo as he frets about the cost of my recent addiction to these crazy good popsicles. i’m laughing because the joke is so funny. “why couldn’t the baker buy a new car? he didn’t make enough dough.” zing-er. I am even so B.A. that I went out and bought another, secret, box – married the two – and went nuts. No holds bar. In college (and for a while thereafter) I used to always calculate things in beer-math, all money was divisible by $5.99 – the cost of a Natty Light 12pack back then. 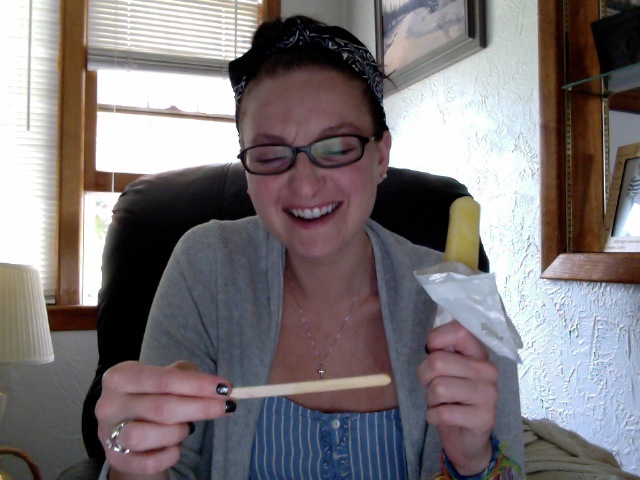 Now a days, it’s ice pop math. How many pops can I get for that? And the chores. Oh the chores!! 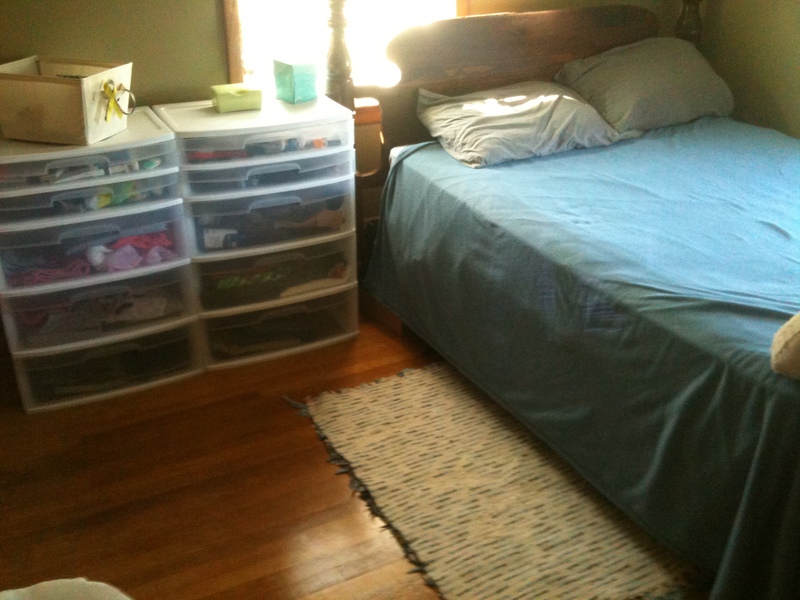 This house is so clean, so spotless – I just went nuts. my battalion of cleaning supplies. fret not at the chemical stuff – i’m home brewing some hippie stuff, and i’ll share about that next week when it’s all ready to go. i promise, promise. I worked so hard yesterday that I did like three and half straight hours of work, and I was dripping with sweat and exhausted afterwards. I literally went around the whole house scrubbing, washing, dusting every surface. I cleaned the floor Cinderella-style. 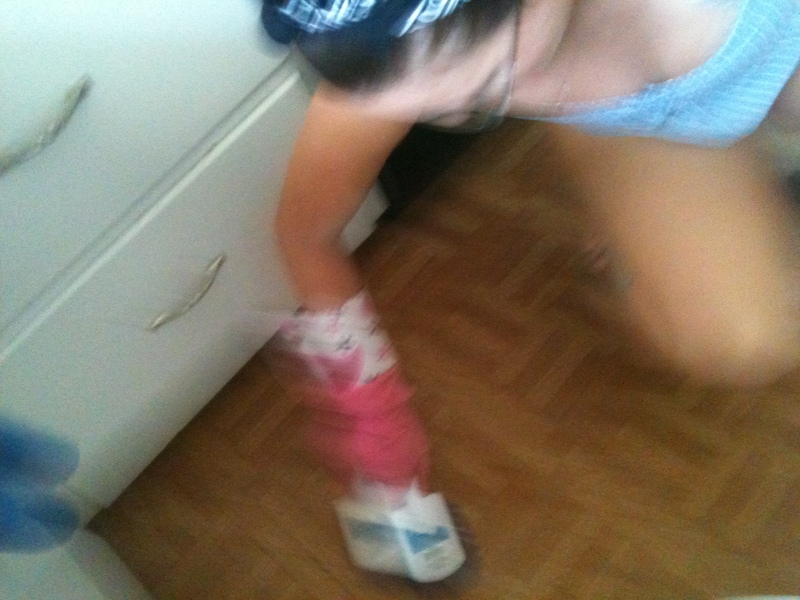 it’s really hard to take an arial shot of yourself cleaning the floor. like, really really hard! I washed the walls! THE WALLS! I scrubbed the toilet and the tub, did the dishes till there weren’t any left. 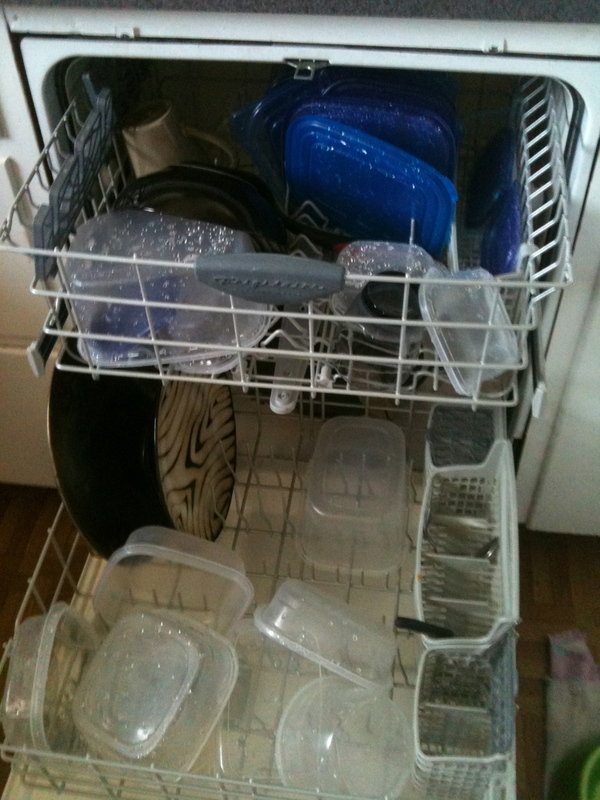 Then I cleaned out the fridge and washed all of the tupperware. Oh how I love a neat and tidy home. It just feels so calm. 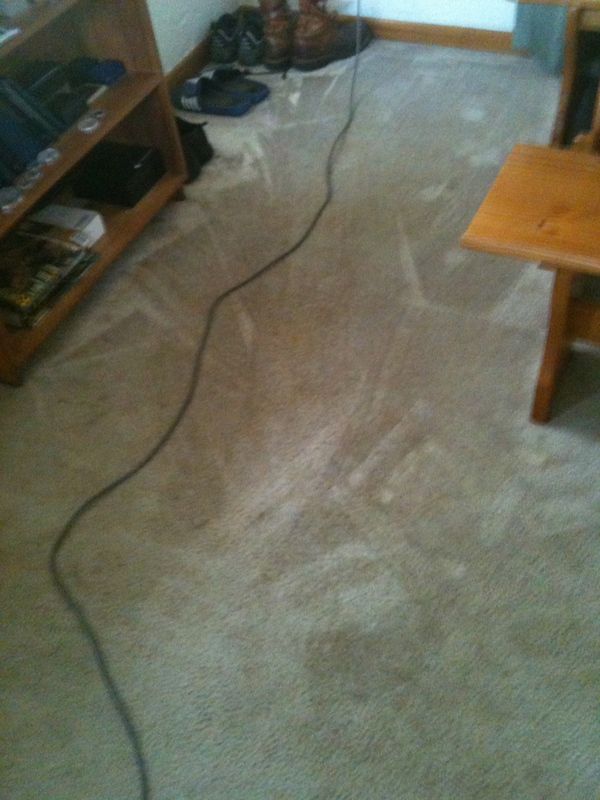 i love the site of vacuum lines on the carpet. think it looks wacky and weird? rocky had an accident, so i also did some carpet shampooing by hand. 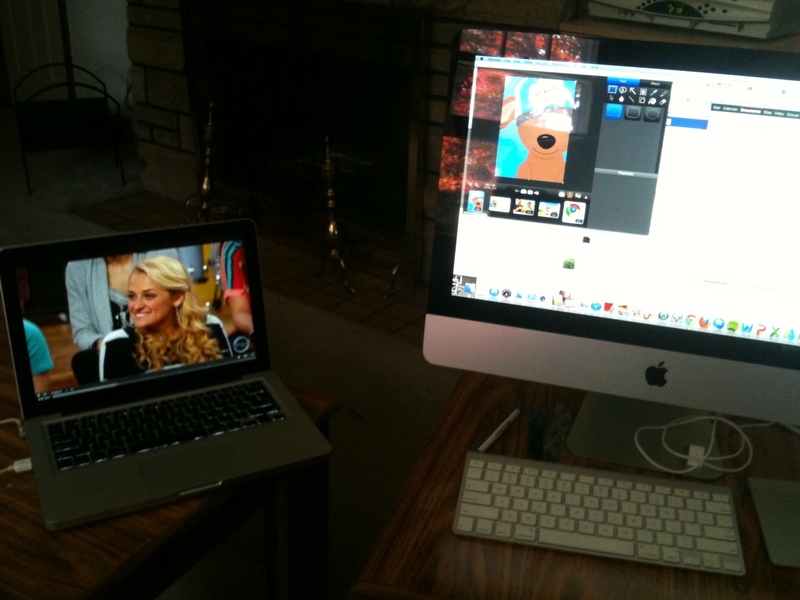 one lappy for shows, one compy for work, social media, blog drafts – you know. and yes, that’s the glee project. love it! 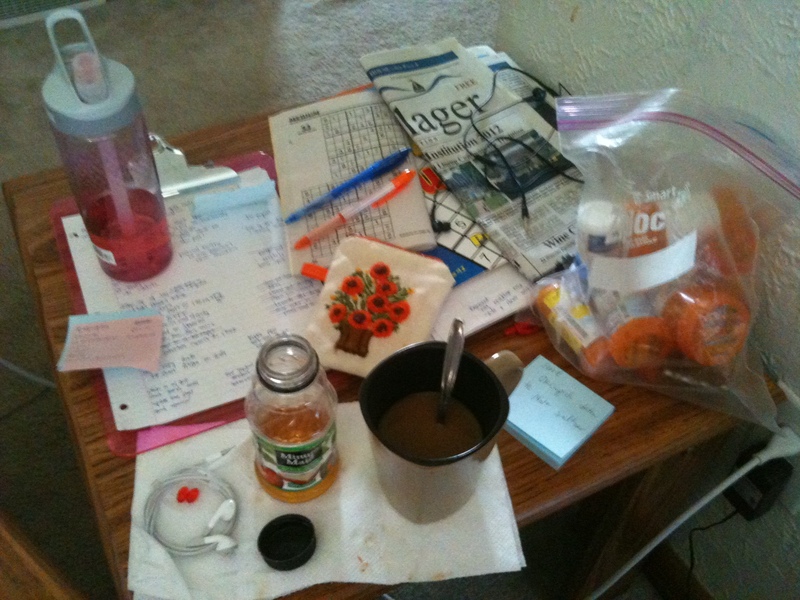 my “work table.” oy… hot pink clipboard, sudoko, coffee, juice, wallet (ebay, oops), meds… post-its everywhere, 25 to-do lists, hope chapel pen from hawaii ❤ i’m a mad scientist, what can i say? The only downside? My two and a half days of me-time came and went all too quickly, and there was still half a to-do list I didn’t even touch. It’s probably for the best though, I’m whooped and tired as it is. And even though I love my quiet and love being a reclusive loner when I get the chance… it is great to have the house full again and for everyone to be here. Okay, I LOVE having my husband back home, and being the smitten little love birds we are, we both randomly woke up at 5am and ended up staying up for an hour, giggling and chit chatting as he told me about the fun they had in NYC… and yes, I ate that middle-of-the-night pop I had a hankering for. Staycation is great, but having a packed house with a weekend of fun things to do is the best! Speaking of- I do believe we have a Crazy-80 birthday party to get going to, so I’ll sign off for now. Hope you’re all having lovely, happy weekends. 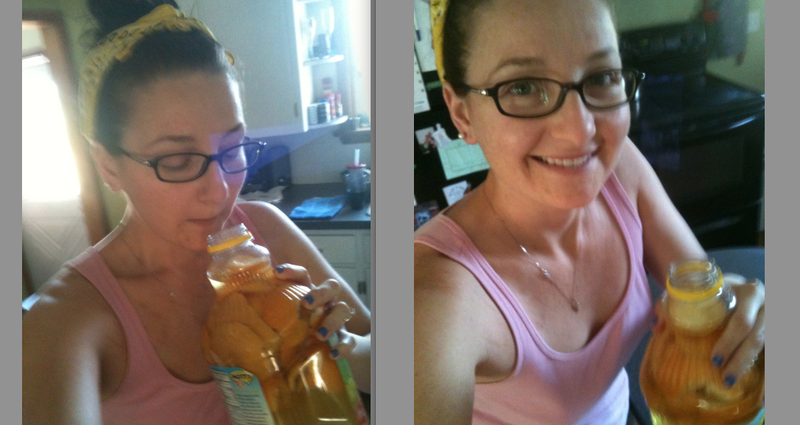 PS: Am I super lame that this is how I choose to spend my alone time? I mean… it was the middle of the work week. At least give me that! On Sunday I posted a rather woe-is-me piece about how I’ve lost my eco-friendly “religion” as of late (I’ve been a slacker, I’ve been in a new place – and I haven’t been adhering to my usual routine of kind-to-our-plantet practice). It’s true. I’ve shopped at Walmart, we’re going through roll after roll of paper towels around here, I’m drinking Keurig coffee and so on… It’s embarrassing. Happy HIPPIE Rose is my blog after all, this is a place where I post about loving the earth and being green and all that jazz. I’m a self-proclaimed hippie and if I expect people to trust my advice or try out my tips, there’s a certain point to which I need to practice what I preach! And really, I usually do. I’m blaming it on our move and all the commotion of living our of a hotel, visiting family for a week, and now moving in with my cousin and acclimating to his routines and what not. 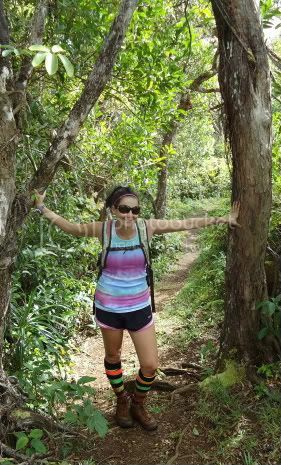 I won’t re-hash it all – go read the post for yourself if you want to revel in my failure. I know I’m super far from a failure right now. As was pointed out in the comments on Sunday, it’s not a terribly huge crime I’ve committed here. It’s life, it happens. My intention was actually never to lament, but rather to come clean and then take it from there. So Sunday I ‘fessed up. Now, we’ll be moving forward. After be-smudging my good hippie name, I did make the self-defensive claim that not everything has gone to hell in a handbasket. There are, actually, plenty of things I’ve kept up with and am doing now that are mighty green. Today, lemme brag on those! I love the earth, I am a legit hippie. There are easy, fun, money-saving ways to run a home and live your life that are kinder to the earth than some of the typical American practices. Especially when it comes to chores, I love to keep a tidy home in crunchy fashion – using hippie cleaning methods. 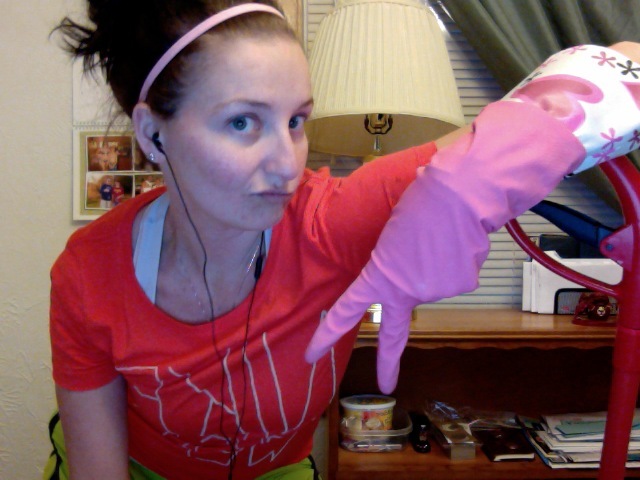 duck face all in the rubber gloves, after a crazy night of chores – i was sweating so hard from cleaning! For one, rags – not paper towels. Paper towels are pricey. And they’re wasteful. Landfills are clogged with paper towels, paper plates, paper napkins. If I must buy some kind of paper product (that’s a disposable version of something that totally exists in reusable form), I at least go for the recycled materials version. Depending on what the use of the paper item was, when you’re done with it you may be able to recycle it – so keep that aspect in mind if the paper-made route is one you must go. But really, rags love messes. Rags are the best! They work better than paper towel, and you just wash them. It’s nice. I get so annoyed at the paper towel commercials that equate rags to smearing bacteria all over your home. UGH. Common sense goes a real long way. If you’ve just used a rag to wipe up some raw chicken goo, how abouts you retire that one to the dirty laundry hamper and not rub it on the counter until it’s been properly laundered. 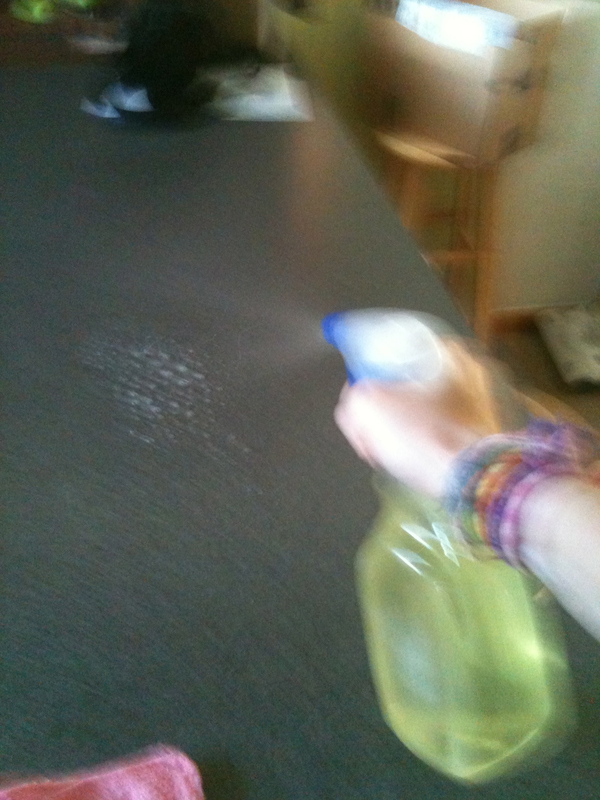 It’s home cleaning 101. It’s how people have been tidying up for years, centuries! It’s not rocket science. I’ll elaborate more on a paper towel based rant some other day, because I feel like I could go on and on about all of the anti-rag marketing and propaganda out there that’s just so bunk. Use rags. Wash them. Apply common sense. You know what really helps the cleaning process? A solution that’s antibacterial. 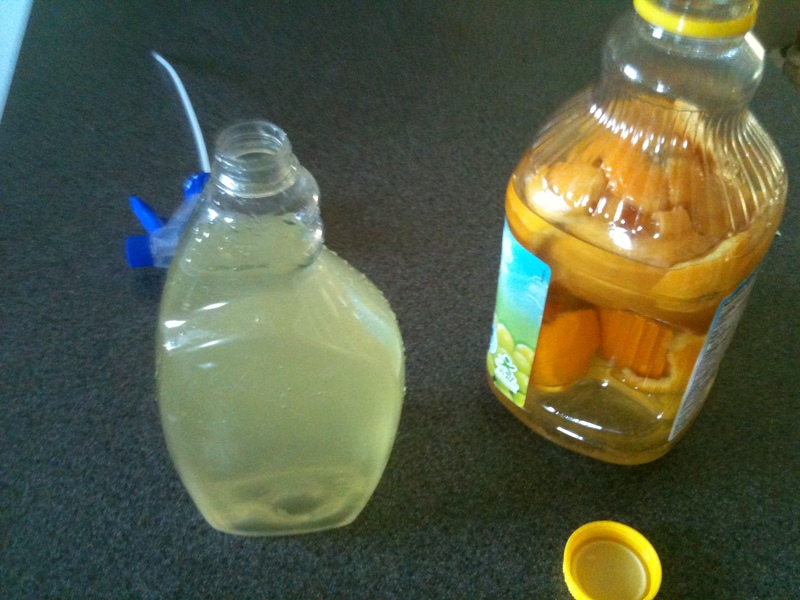 Like say, white distilled vinegar (WDV). WDV is amazing. It kills germs, it cleans up all kinds of messes, stains, spills, grease, gunk, and more. Yeah, it smells strong at the time of use – but as it dries it is 100% odorless, colorless, and unnoticeable. vinegar is heaven’s nectar. it does everything! I use WDV everywhere. 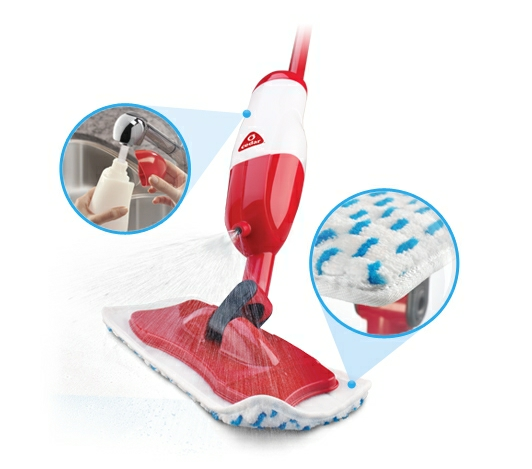 Dishes, laundry, surfaces, mopping solution, the bathroom, the bedroom, the living room. 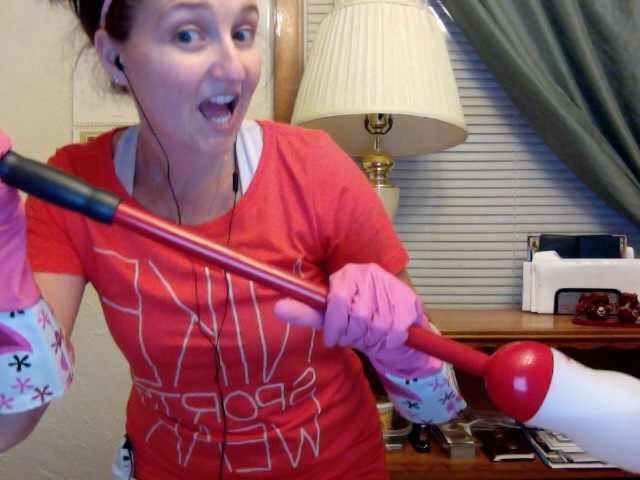 Anything that can be cleaned, I involve WDV somehow. 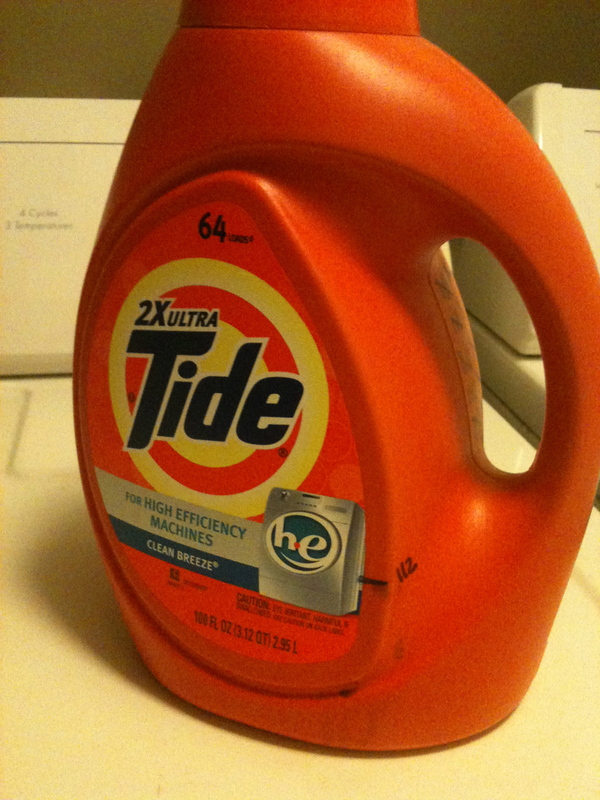 Remember my old Tide Challenge? our current laundry room set-up. 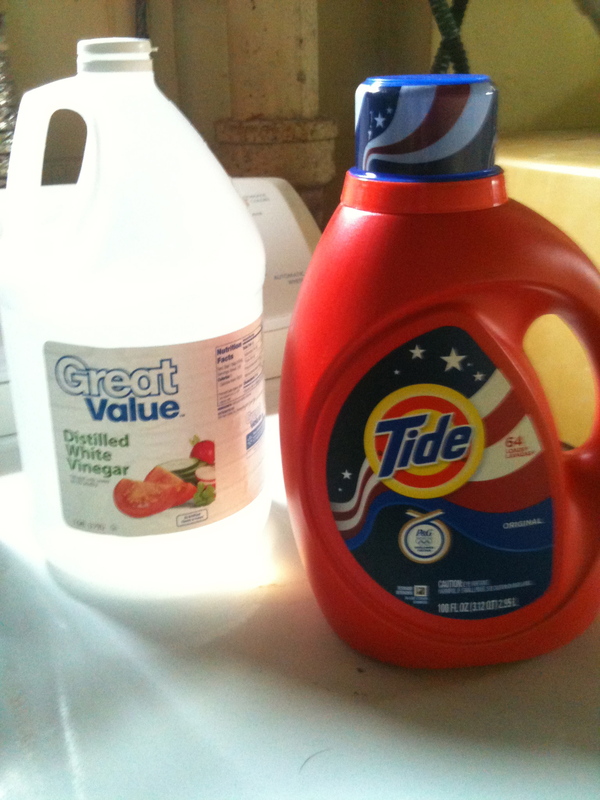 tide + wdv = a cheaper, better way to do every single load! 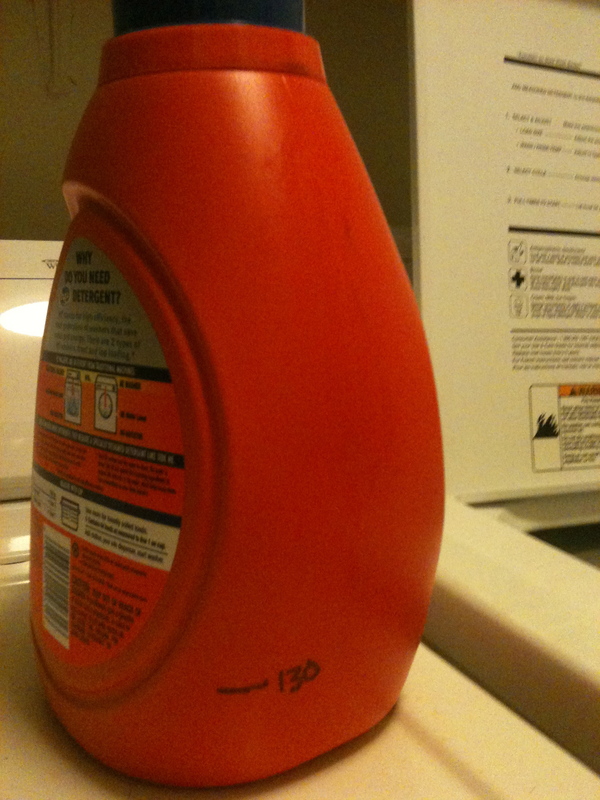 (I bought a big jug of liquid Tide, very pricey and wonderful smelling laundry detergent – and as an experiment, I diluted it with WDV for every load of laundry to see how far I could stretch a bottle). Here’s the premise of the challenge, a midway update post, and finally – the results post. Check those out to read all about the magical laundry powers of WDV. Detergent, microbe killer, disinfectant, funk eliminator, fabric softener… it does it all. And in its wake it leaves clean-smelling, lovely, soft clothes. Speaking of reusable rags and WDV, let’s talk about mopping. If you so much as own a Swiffer, I don’t even know if we can be friends. Swiffers are so so so so bad. They’re evil! They create so much waste, and why? For what? It’s lazy and ridic. You can get a mop with the exact same function as a Swiffer (the spray with the little pad on a stick that you use instead of the old school rope mop or the sponge and squeegee kind) that – get this – uses a reusable pad on the bottom. Instead of those pre-soaked Swiffer pads that cost a fortune, are chock full of chemicals, clog up your garbage can, and eventually our whole planent with all of those dirty pads – just use a mop with a washing fluid chamber that squirts out a little stream of cleaner and houses a cloth pad on the bottom that you simply wash and reuse. 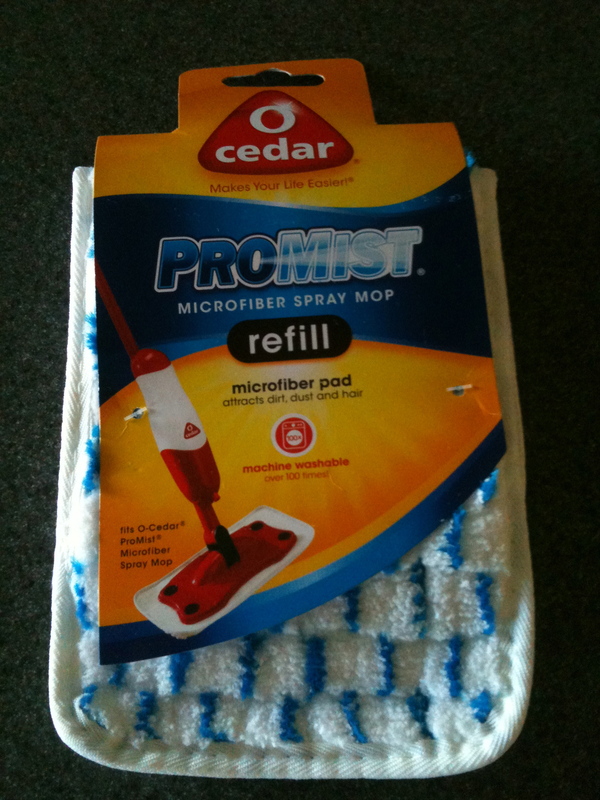 I used to have a Lipman spray mop back in Hawaii, with reusable cloth pads. I liked it just fine. When we arrived in Western New York, I needed a new mop, though. (The Lipman worked just fine, it was packed up and it’s in the Pacific Ocean on a ship somewhere, with the rest of our belongings). Totally coincidental to my viewership of Celebrity Apprentice (really, I didn’t realize it was the same mop from the show until just now as I was looking it up online and saw Lou Ferrigno pics), I am now the proud and ecstatic owner of the O-Ceder ProMist spray mop. i love celeb apprentice, but did not love lou. he was actually super annoying. but, he’s repping my new mop, so i gotta give him credit for that. i love this mop! It caught my eye because it was the cheapest one of its kind in the store. And boy oh boy am I so glad I took this baby home! There’s a microfiber pad that easily sticks to the bottom, I bought a secondary pad for a few dollars – so if one’s in the wash, I can still mop it up. And in the RARE case that a mess deems you must mop with something disposable, they do sell paper pads that fit as well (but don’t do that, just wash the reusable ones). It’s great. It’s so sturdy, the head pivots so nicely. It’s incredibly easy to use, and it’s so eco-friendly. 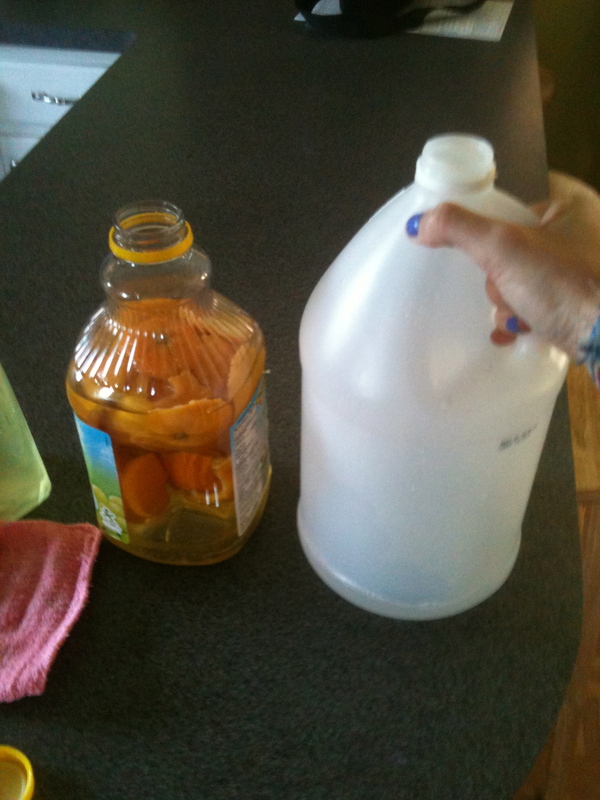 I fill up the cleaning fluid tank with a simple mix of WDV and water. 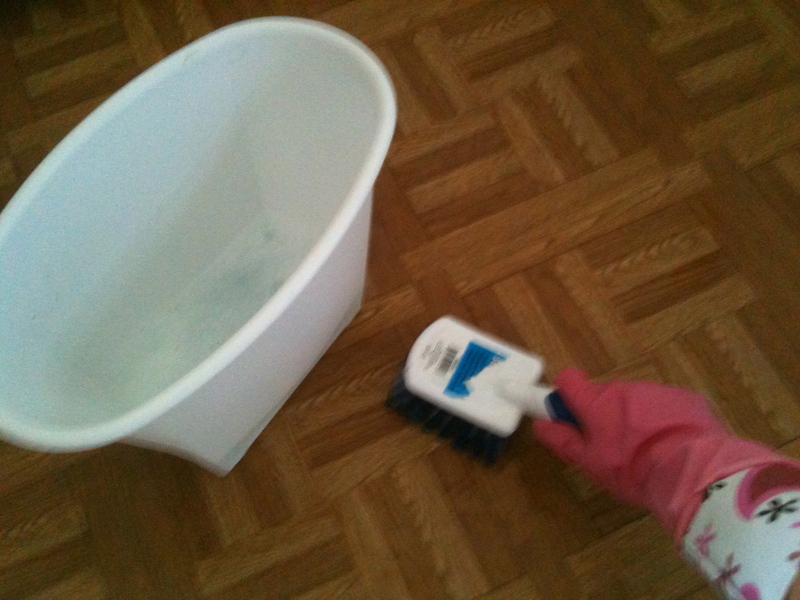 WDV is the perfect mopping solution, you know. It kills the germs, it cleans, the floor will sparkle and shine – withOUT the stick left behind from Lysol or whatever other chemical mopping stuff you use. And yes, it smells wacky… but as soon as it dries there is no scent. None! look at the shine on that floor – nice! machine washable. very very easy. Okay, I think you get my point about the cleaning. It’s so easy to do, y’all. Being green is not hard, it’s not always expensive or scary. I know that when you’re in the grocery store and you see the free range organic food, it costs more than the hormone-filled antibiotic-ridden regular version. The monetary commitment to an eco-friendly life can seem daunting. But that’s only for certain types of green living. For most of the things I do around the home, I actually save money. WDV is way cheaper than any fancy cleaning product you can buy. 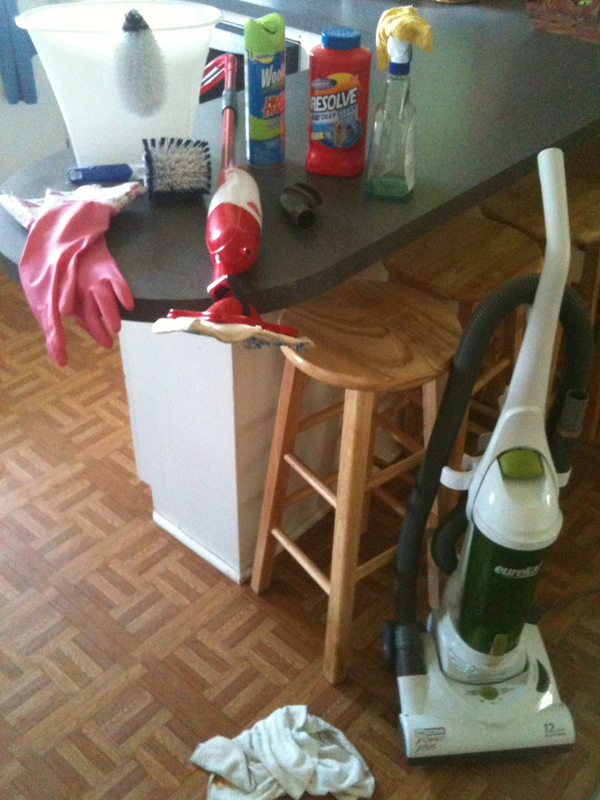 Samesies with baking soda (another awesome cleaning agent that works miracles). Buying something once, like a rag or a towel and then being able to re-wash it and use it for a really long time is epically cheaper than going through disposable stuffs. You get the idea? I hope. Now. I know I mentioned food. So there’s a couple more things I’ll sling into this post. We feed our dog fancy food. As in, organic doggie food. I don’t believe in making him eat that corn-filled, horse meat, food colored, toxic fake garbage that’s all fillers and no nutrients. We were so blessed at the ole MCBH Commissary, because they carried Organix brand dog food and it only cost a dollar more than the typical on-the-shelf doggie food crap. Specialty dog foods can be very pricey and you may have to go out of your way to get your hands on them. I understand that’s not feasible for everyone. But check this out… Purina has a new label of food out, and although it’s pricier than the typical bag of Beneful, it’s still very affordable. No corn, no fillers, no super duper garbage – and it’s made by Purina (my cousin works there, as does my Uncle Bobby, we love Purina around here). JJ loves it! He eats it right up, and we’re able to easily find it in the dog food section of our local grocers. 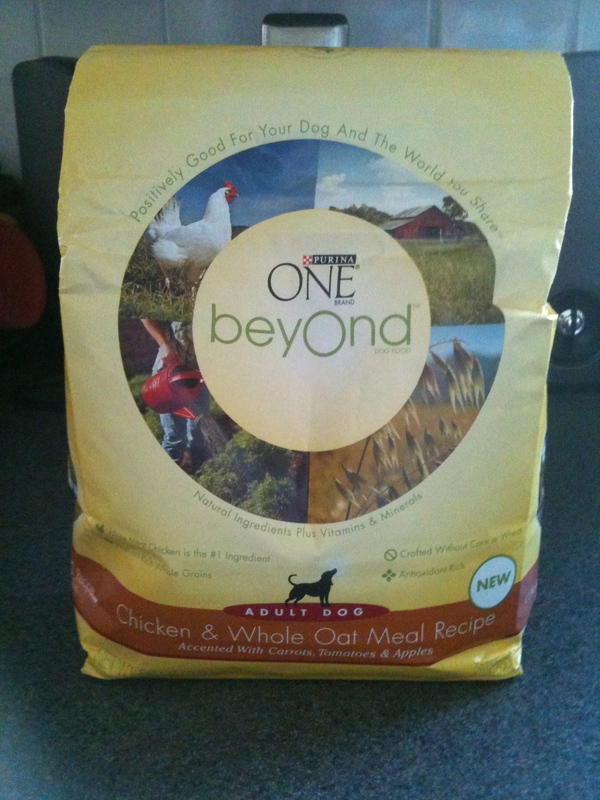 It’s called “One Beyond” and the commercials are super cute too (they always advertise for it on Hulu, I’ve noticed). And finally. I know in Sunday’s post I lamented about drinking coffee from the Keurig. The uber-wasteful single cup coffee dispensary that makes you a solo cup of joe, out of a single disposable plastic-y cup. Oy, the waste. So much garbage, so much packaging. 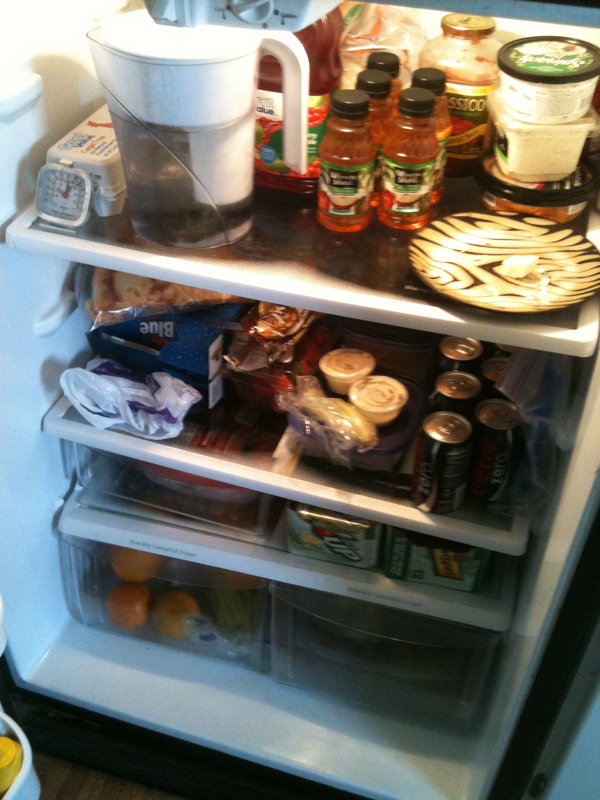 It’s convenient and lovely and delicious – yes. But the hippie in me just feels like such a heel. 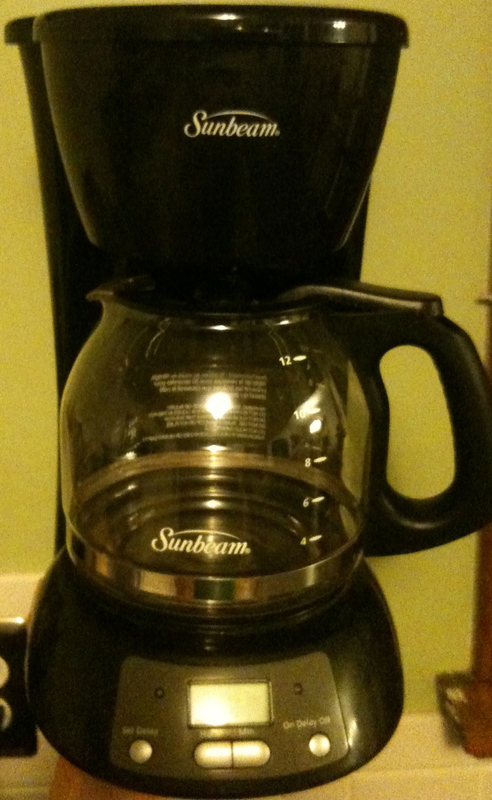 So, I went old school and busted out the regular coffee pot. 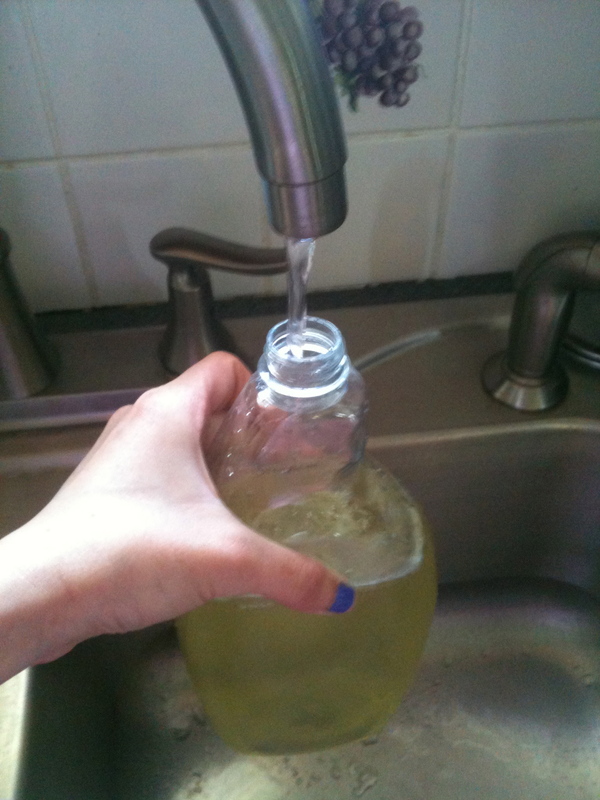 It’s a lot less wasteful, as long as we drink all that we end up making. Coffee itself is such a slippery slope of hippiedom anyways… from fair trade, to poor work practices and shady farming, etc. So I won’t get into that side of the bean in this post. I’ll just tackle my end, the making and drinking side of the story. And yes, I’m still imbibing in the Keurig-made stuff (it’s what we have in the house), but I’m not exclusively drinking Keurig and I intend to make my way back to the good ole brewing pot. 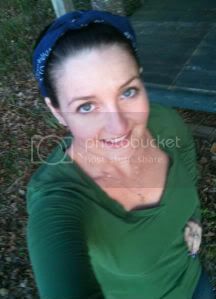 Yeah, I’m not as super duper green green green as I had it when we were in Hawaii. I’ve slipped a bit, I’ve let some things slide. I’ve had to make accommodations and adjustments because of moving. But I’m turning it around. And hey! Even on my worst days, I was still maintaining some very clutch eco-kindly habits. Some is better than none, every little bit really does help. So as I continue to get my green groove back, I’ll keep y’all in the loop. The tips and tricks I learn, I’ll pass on. Because let’s be real, I didn’t invent this stuff – not by a long shot – other hippies taught me, and thus I want to teach you. And if you have some good tidbits, tell me! Shoot me an email or let me know right here (happyhippierose@gmail.com). 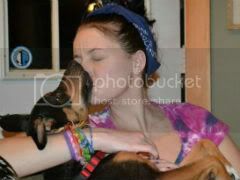 I’m always looking to build up my repertoire of hippie living. So go out, get some WDV and a spray mop and clean with kindness. Happy Housekeeping, y’all! …And By Jams, I Mean Tie Dye! I’m so excited, I just gotta share this news with someone. I’ve been asked, last minute, to host a craft booth at my Church’s Women’s group event this Monday. As in, a few days from now! Over 350 women have already signed up and paid, but even more are expected. For some people this may sound so small-timey. But for me, this is my first time selling tie dye at an event, or really selling in person at all. 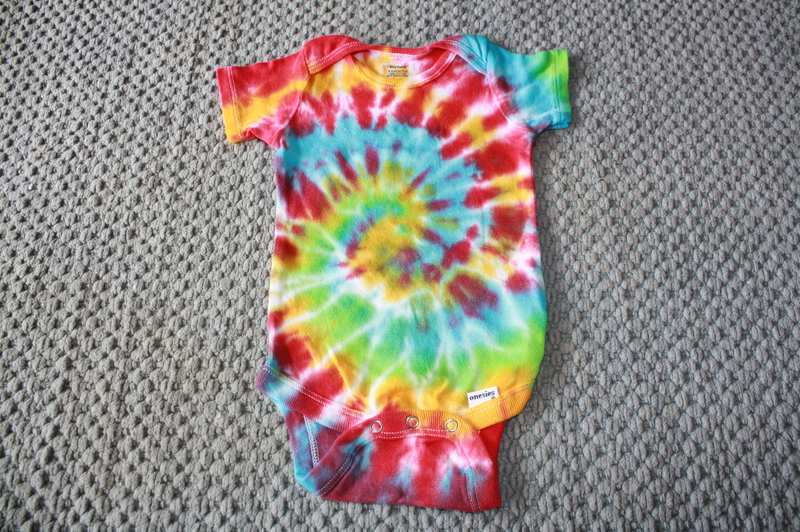 So between now and then, I need to crank out some tie dye! 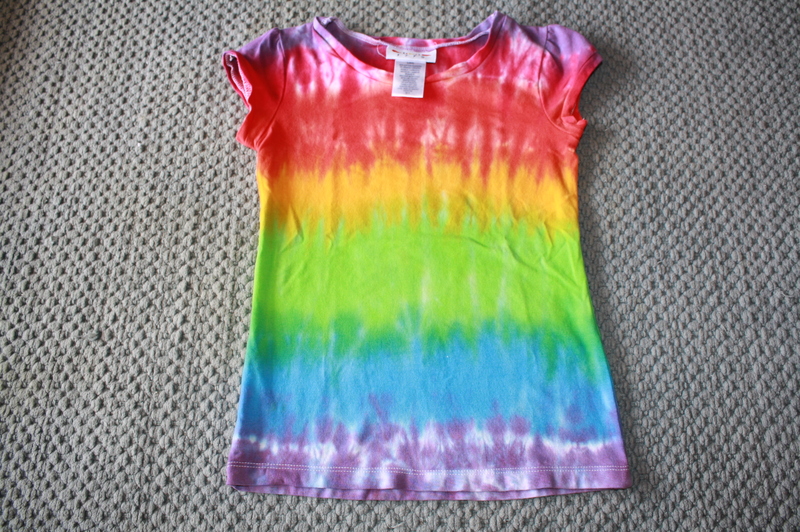 i need to make lotsa tie dyes, like this! My folks used to own a phone card business (trust me, I know that sounds so bizarre). Back in the 90’s my dad and I went to France with my elementary school’s exchange program (he was the group translator, that’s a whole ‘nother story on it’s own; he learned french in eight months just so he could be the translator, hahaha, Viper is amazing!). So we get to France – and all the pay phones required these prepaid cards you swipe, no coinage. Dad thinks it’ll be the next big thing, we become the biggest phone card dealer in the whole Southeast, and the only licensed dealer of Visa Cash Cards (a derivative of phone cards, it’s a prepaid card, like a credit card – but not based on credit, it’s just prepaid so you don’t have to carry cash around). Next thing ya know… those pesky cell phones become all the rage, and payphones become all but obsolete. But anyways, back in the heyday of the phone cards, we used to travel around to all kinds of conventions and sell them. I’m talking Europe, Asia, everywhere. 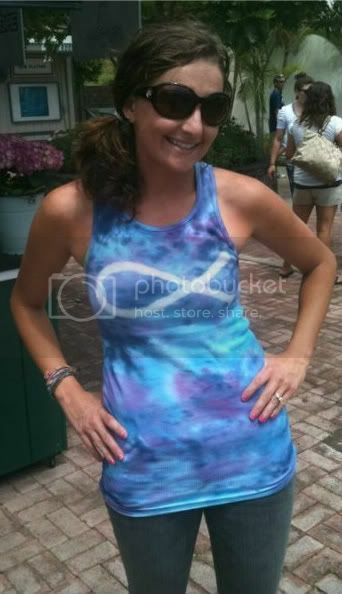 So I know how to stand at a booth and sell… I just haven’t done so in a decade and a half, and never with my own tie dye. I have a feeling it’ll be like riding a bike though. My Dad (Viper) and Step-mom (Anna) still actually run the business… it’s just not as crazy booming as it once was. You can check them out: Kars Unlimited. Okay, I have company coming in this afternoon. Another guest for dinner will be coming over tonight. And I have all this tie dye to crank out. (And maybe make some pricing signs, I have to sort and prep all the inventory I do have, and make some kind of poster for custom orders or something). Not to forget- at the very same women’s event I’m hostessing a toiletry drive for the local women’s correctional facility. 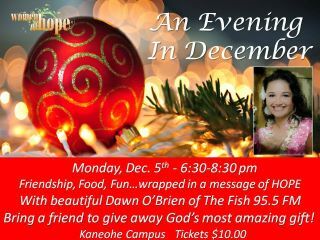 They do gift bags at Christmas for the inmates, and we’re collecting donations for said gift bags. Oh, busy busy!! Lots of sheets to wash, laundry to fold, sweeping and fixing up to do. Oh my! P.S. If you’re interested in helping with the toiletry drive, let me know anytime before midday on December 5th (Hawaii time), and we can figure something out! 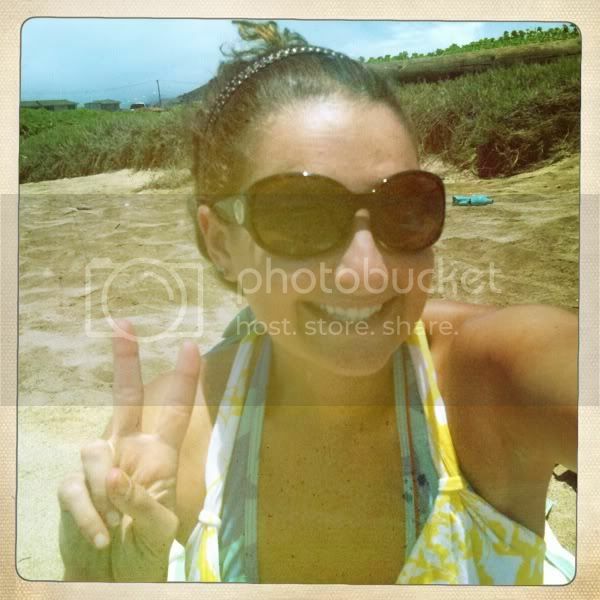 You can comment here or email me: happyhippierose@gmail.com -thanks!! P.P.S. I really will make a siggy soon! I swears it! one of the kids' shirts i'll be selling! Remember my Tide Challenge? 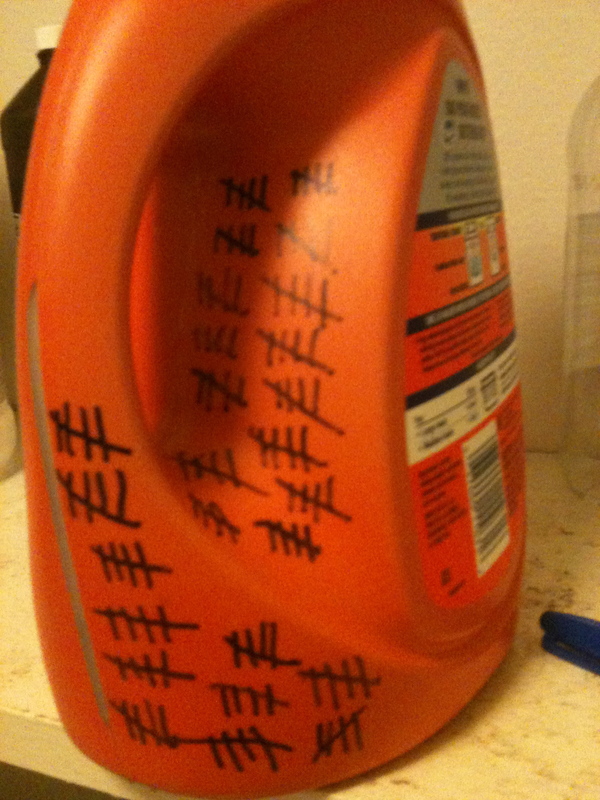 I’m trying to see how many loads I can milk out of one bottle of Tide liquid laundry detergent by cutting it down with vinegar. (check out the original post about the challenge: Tide Challenge Blog Post). I’ve officially lived in Hawaii for a year, and thus I’ve owned the same bottle of Tide for a year. I think an update at this juncture is, by all means, appropriate. As of 12:33am HST, July 20, 2011 – I’m at ONE HUNDRED THIRTY loads. From my “sixty-four load” bottle! Yeah, take that! tally marks of green and thrifty greatness! At 130 loads in a year, simple math says I average two and a half loads a week. That feels about right. For seven months of the last year, my husband was deployed. During that time I only had my own clothes to wash. I own a ton of clothes and I can really stretch it out a while before doing laundry becomes necessary. Also, living in Hawaii, my loads are of small summer clothes: I can fit a few weeks worth of wardrobe in one wash. (wowee awesome alliteration). 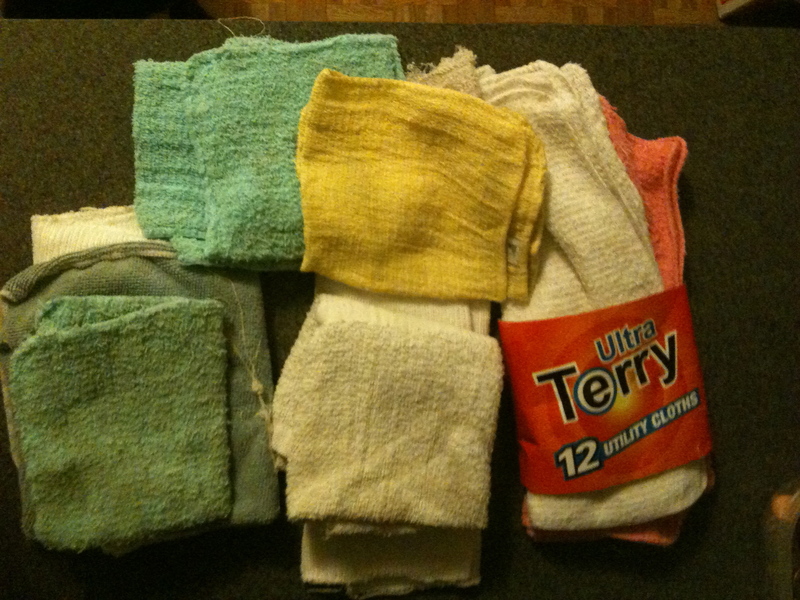 I re-use towels several times, especially beach towels. (For tie dye loads I don’t use Tide – I use a special product; so business loads haven’t been factored into my guestimates/stats). I still have a bit left, I’d say maybe 15% or so? We’ll see. With the bottle being so dark and varying in widths, it’s hard to guess for sure. I’ve marked some lines show a couple different levels. Boasting “64 Loads” I’ve just doubled their claim. My goal was to possibly triple it, but we’ll see. That would mean 62 more loads. As optimistic as I am, I sure will try! But even I know that we’re pushing it now. I’m not going to start using super tiny amounts just for this project, don’t worry. I’ll stay the course and we’ll see what happens. 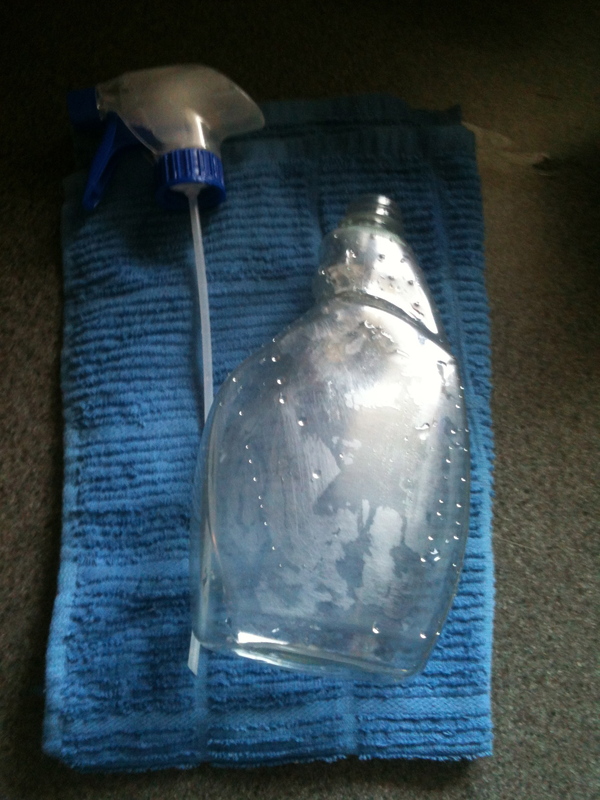 For anyone who made the switch to using vinegar in the laundry room – what do you think? How clean are your clothes? How happy is your budget?? I’ll keep y’all updated, and for sure I’ll post when the bottle runs dry (hopefully not in the near future)!